When looking at making homes more energy efficient, many homeowners and builders are favoring tankless water heaters over traditional ones. This new generation of water heaters professes to provide nearly instant access to hot water thereby reducing water consumption while the user waits for the water to heat to the desired temperature for showering and cooking. Since the tankless water heater doesn’t have to keep 40 gallons of water at a constant temperature, these units can dramatically reduce energy consumption as well. Recently, a member of the Global Warming Solutions Group found himself ready to make the switch. Here is his story. I am certainly not an expert on the subject of tankless water heaters, but I did just research the subject, purchase, and install one. And so far, after a few days, it seems like we did OK.
Our conventional water heater had started to make clanking groaning noises any time it was pushed into action. As it was pushing 15 years old it seemed prudent that we consider replacing it. I had seen several articles indicting how much more efficient tankless water heaters were than the conventional water heater with a tank. One other requirement we had was to improve our ability to have enough hot water to fill Tracy ‘s deluxe spa tub. This has proven to be a big improvement, where the old standard tank water heater would regularly run out, the continuous nature of a tankless model keeps delivering hot water when you want it. When looking at tankless water heaters you need to understand how much water it can heat per minute, since it heats it as you ask for it. The specifications tell you that a certain model can heat say 5 gallons a minute by 80 degrees or 8 gallons per minute by 50 degrees. So in the winter at our house the water coming into the house may be 45 degrees, so to get the hot water to the typical hot water temperature of 125 you need it to heat the water by 80 degrees. So you will be limited to 5 gallons per minute. Is that enough? Well, I took a 5 gallon bucket to the bath tub, figuring that would take the most hot water of any thing in our house, and timed how long it took to fill. It was just over a minute – so based on this simple test it seemed the model I’d selected would work. If you have four showers and a washing machine all going in the morning before work at your house, you’d need to devise a test to see how much hot water per minute this would require to be your limit. 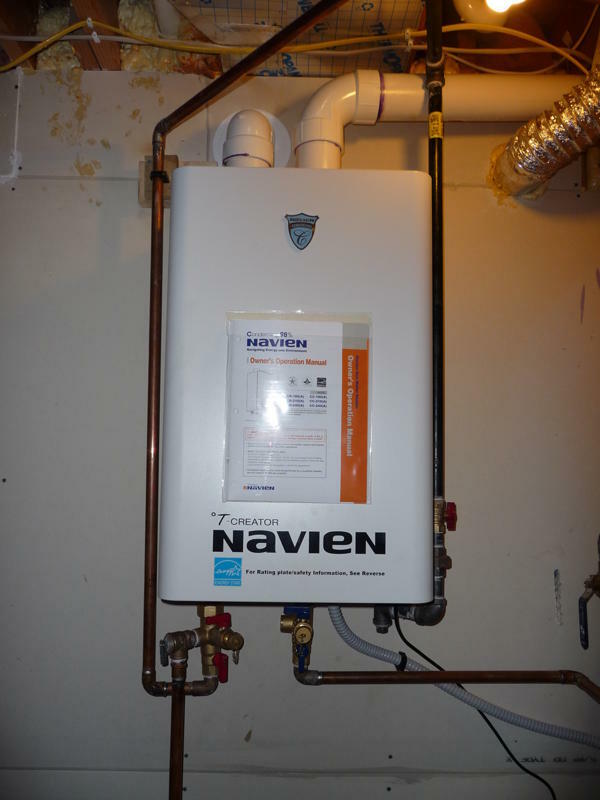 After some research on the web, and some calls to some plumbers who install tankless heaters, I choose the Navien 98% CR210 made by a South Korean company. To get this brand I had to call Kroeschen Supply in Toluca , since they were the only company that carried this brand and were also enrolled in the state Energy Star rebate program. My web research found two problems that caused me to go with this more expensive brand. The first was the common brands available at the big box home improvement stores that fit most of my technical requirements, was panned for poor quality in a number of on-line reviews. The other was a technical issue; the model I choose was more efficient which meant lower temperature exhaust, which meant it could be vented with PVC pipe vs. double walled stainless steel vent pipe. This was important because the PVC pipe is the same size as the metal vent pipe from my conventional water heater. The double walled vent pipe is 2 inches bigger in diameter than that so it would have involved a major construction project just to install the new vent pipe. Also of note, the new water heater required a 3/4″ gas line where the old only had 1/2″. The model I choose was $1600, then minus a $390 state EnergyStar rebate, minus a 30% federal tax credit for another $420 off. This brought it down to $790 plus sales tax. This compared to a typical water heater which costs about $350. The company web site suggests to expect it to save approximately $80 per year in energy costs over a typical tank water heater. So ignoring installation cost (which is arguably not totally fair since replacing with a conventional model would have been simpler and cheaper) if the new water heater lasts for more that 6 years it will pay for itself. And, that doesn’t include the reduced carbon emissions. I was able to get my new water heater installed, in a grueling weekend, without paying the professionals. I was quoted approximately $1000+ for installation. I did end up spending a little over $300 in additional supplies by the time the new vent piping and re-plumbing was done. Now to figure out how to get the old water heater recycled? 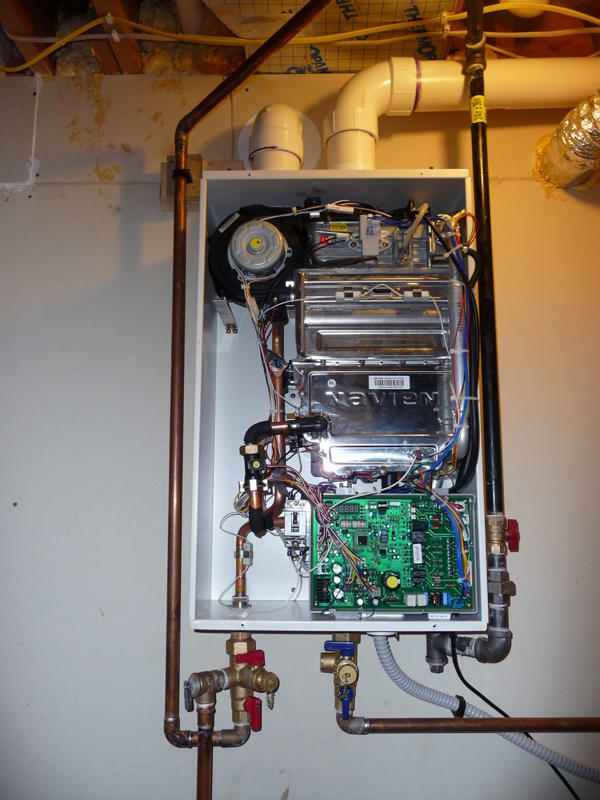 Feel free to comment on this story or to share your own experience with tankless water heaters. We’d love to hear from you! I bought this level-of-use water heater (the smallest of three versions) so that it might match underneath my kitchen cabinet. I’ve been utilizing it for a few days now, and am thrilled that I get warm water each time, day or night time, no matter happens, in about 1-2 seconds, max.